I think currently is the only way the two files 'Stars-bin.sc' from the '.pak' file in the folders 'data\catalogs\planets' and. 'data\catalogs\stars' to copy and the 'Del Tri' stars to remove manually from these files! Yikes! I was afraid of that. Thank you for the heads up. 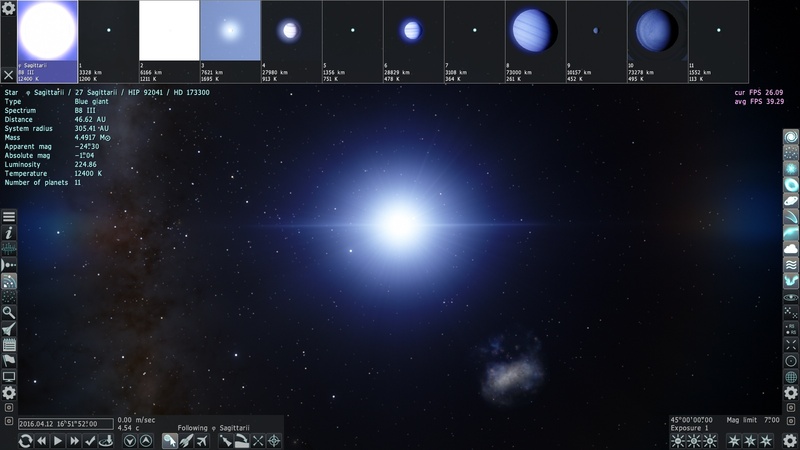 The star Keid 40 Eridani west of the star Rigel in Orion, doesn't have an apparent magnitude of -0.17. It does in SE 0.974 RC2. I don't understand. Apparent magnitude change with the distance from the object, and so it does correctly for Keid system, both in RC1 and RC2. The stars Nuki (34 Sgr) And 27 Sgr are missing which make up part of the “teapot” of the constellation Sagittarius. But unlike Capella, these stars are missing. Or at least it appears that way. 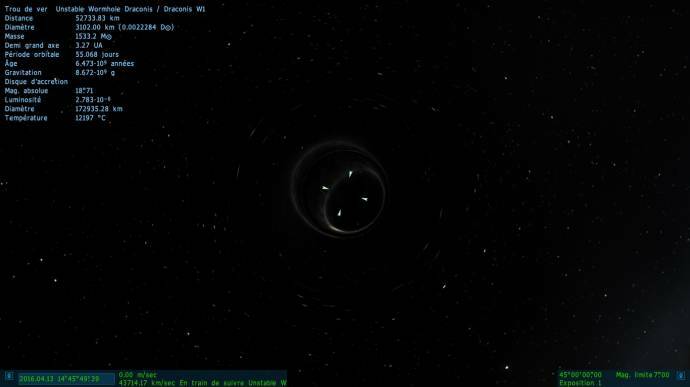 Mintaka appears to be off in Right Ascension and Declination in SE 0.974 RC2. About the incorrect position of Mintaka has been discussed in this thread. There are a quite a number of stars who have this error. A '.zip' file with corrected scripts can be found here. The star Keid 40 Eridani west of the star Rigel in Orion, doesn't have an apparent magnitude of -0.17. Maybe you could create a corrected script and post here? I think Kosh means the 'AppMagn' from Earth seen. But in Wikipedia, the values for the three stars are given individually. I have no idea how to calculate the total brightness of all three stars, but I suspect that it is brighter than 4.43, the 'AppMagn' of the brightest of the three stars, but probably not 0.18, which SE shows for me. Is anyone else finding visible plant life textures on deserts that only have terrestrial unicell life in RC 2? I don't know if it's normal or a bug. JackDole You are correct on what I meant. Keid 40 Eridani looks brighter than Rigel as seen from Earth in SE RC2. I'm going to reinstall RC2 and see if Nuki shows up. I suspect on the next release of SE a lot of this will be fixed. That's not a bug, and has been in SE for a few versions now. HarbingerDawn, good to know, thank you. 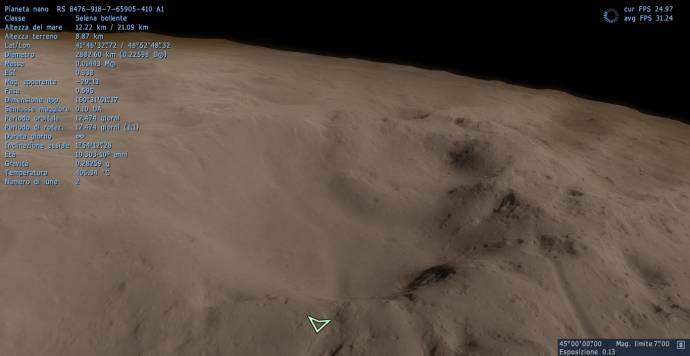 Can we also have real 3D craters in SE like in Elite Dangerous? Notice how diverse is surface of the rocky planets! 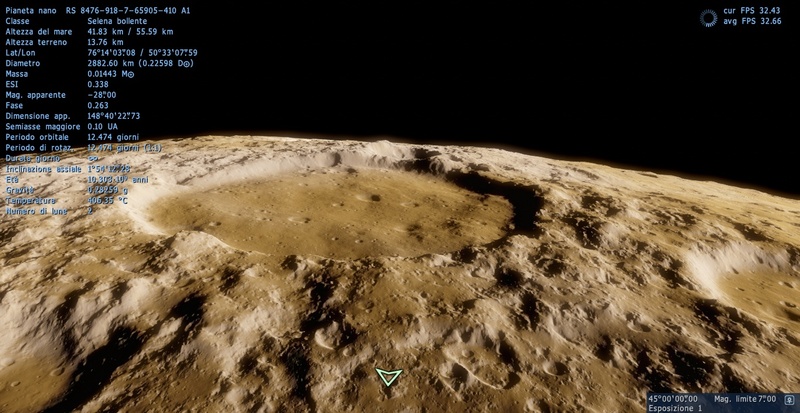 You have some giant cracks ,canyons , small and huge craters. by using a video as reference it's a tad difficult to say but it seems to me your parameters are ok. 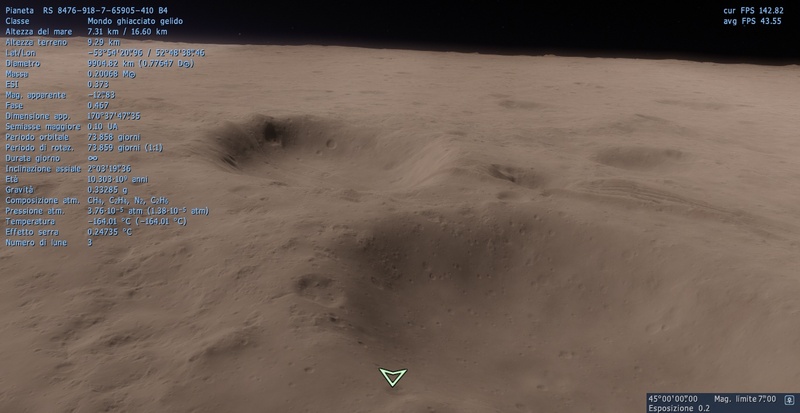 If you visit younger impact craters, I'd suggest you could use a lower exposure, because they have an high albedo, just as it happens with our Moon's youngest craters when it's full. Maybe they're a bit too much bright, I concur. Anyway, they seems real 3d enough to me. It's a work in progress, but right now I think in your journeys you'll find what you said, and more. he "Complex calendar" star had moved 4200 light-years from its original destination, and the nearest star was now 1.67 light-years away. Wonder if SpaceEngineer can re-find us a planet with a complex calendar, or maybe post the exported star system? 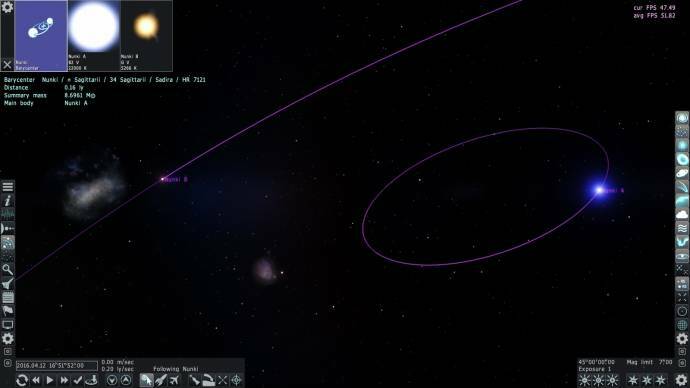 It exist in Astroniki's updated Milky Way. I included it into default locations accidentally. What pixel shader model does SE need? According to wiki my R4850 supports Shader Model 4.1 and OpenGL 3.3. Something tells me that SE requires Shader Model 5.0 and OpenGL 4.x . 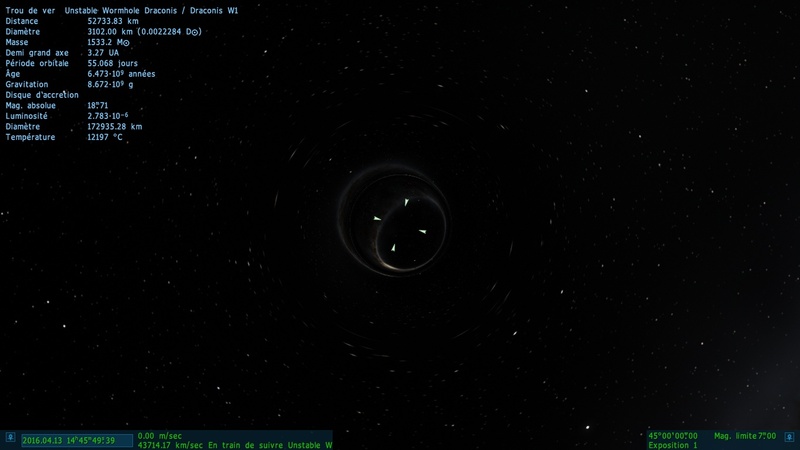 In fact, I had put a accretion disk to a wormhole but it no longer appears although it has the information (I know this is unrealistic). ERROR: seMesh::LoadOBJ(): Error opening the file "#/models/spacecraft/Addons/Star_Wars/TIEFighterHigh.obj"
Anyone know what to do here? I copied the spacecraft files in full from 0.973. SpaceHopper, do you have the models in addons/models/spacecraft/Addons/Star_Wars/? Or addons/models/spacecraft/Star_Wars?